Our Comedy Room is the perfect size for family parties and corporate events too. Comfortably hosting up to 150 people, the room has its own bar, a private entrance and a stage that gives you a platform to plan your ideal evening’s entertainment – live bands, DJs, whatever you fancy! We offer the room on a guaranteed minimum spend rather than a hire fee, so you will receive full value for every penny – just choose a meal from our delicious party menus and why not order a few bottles of bubbly too? Our Events Manager can advise on all aspects of party planning – we want you to have a wonderful night of celebration, free from the worries of playing host, giving you the time to really enjoy the occasion. 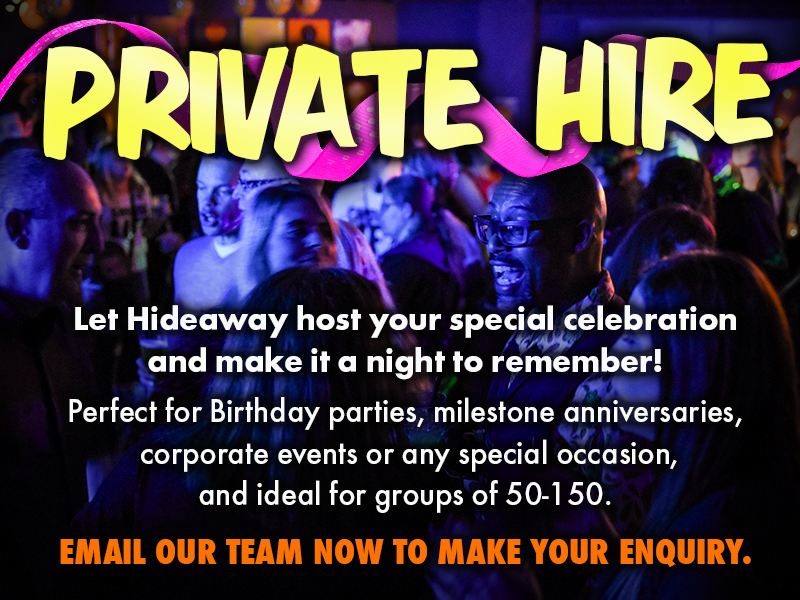 For larger parties, we can also make Hideaway’s main room available on selected nights.